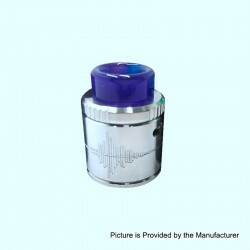 The original Mecanvape Voiceprint RDA is a 24mm RDA with innovative X style post design. The positive post and negative post are cross, and you can build coils easily on this deck. The Z style airflow tunnel can efficiently control the airflow and provide purer flavor and more clouds. 810 resin drip tip is included. This RDA comes with bottom feeder pin. This item also has other colors to choose.